I feel so blessed and lucky to have the opportunity to attend British Council's Teacher as Researcher ELTDP Symposium held at Hilton Hotel, Kuching on the 20th to 22nd February 2013. 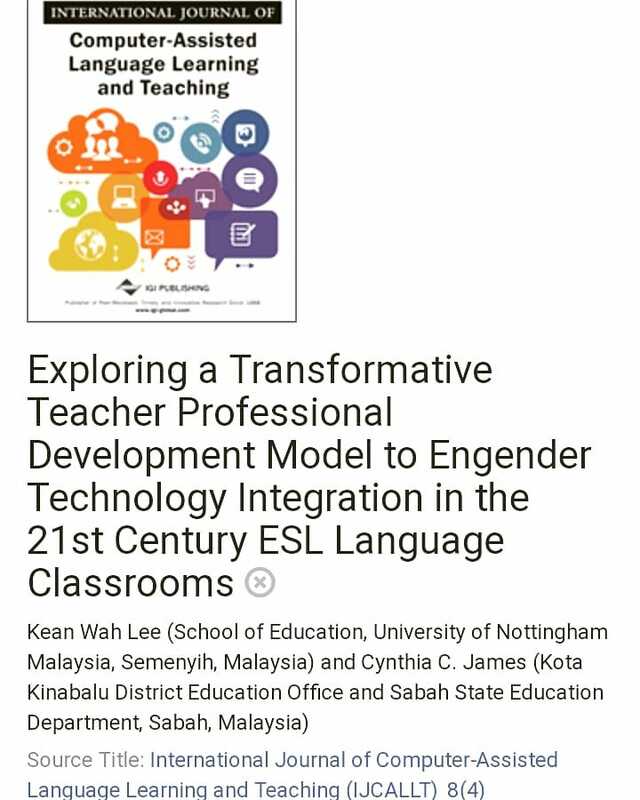 I went there with the rest of the delegates from Kunak - our Language Officer, Sapiah A. Ong; the ELTDP mentors - Justyna Skowronska and Mark Smith; my fellow English teachers Haniza Khamis, Norainah Arif and Siti Maisarah. My headmaster Ahmadidin Rosidin and his wife Norhayati Dawood were coming too. According to the symposium's official site, there would be 69 presentations and 115 mentors-mentees attending the symposium. I predicted that it's going to be a fun and fruitful trip to Kuching - and I was right. It was indeed fun and fruitful - and more. I don't know if I can adequately put into words my feelings and emotions about the symposium. Perhaps I can summarise it in one word - overwhelming. The joy is overwhelming, the satisfaction is overwhelming, the longing for more is overwhelming. This post is my attempt at putting in writing my feelings and experiences during the three-day symposium as best I could. During the opening ceremony, Tricia Thorlby, the Director of ELTDP started off by telling the audience of her dream about the symposium. She related how she dreamed of having an event where there will be a celebration of teachers' successes and achievements. Then she invited Puan Ho Wooi Cheng of the Curriculum Development Division to give her speech. Puan Ho related how far the ELTDP has come within these past two years; how the project had to face a lot of obstacles and challenges in the beginning; yet through hardwork and patience and perseverance of all the people involved, everyone is starting to come together and embrace each other in mutual understanding, respect and cooperation. I was emotionally moved by both speeches, and I found myself fighting back tears while listening to them. Mr Gavin Anderson, the Country Director of British Council Malaysia then took the stage and gave his very brief yet equally emotionally touching speech. He said: "Look at the person next to you: the person who have achieved so much within these past two years, feel it in your heart and congratulate the person. This is indeed a moment to celebrate. This is a celebration." I blinked my eyes a few times and muttered under my breath: "Oh, stop crying, you fool." Just when I started to feel stupid for being so emotional, I caught a glimpse of my teary-eyed colleague who was sitting next to me. "Are you crying?" I tried to tease her. "I love the word 'celebration.' I LOVE it," she said in between sobs. She didn't seem embarrassed. I looked at her for a few moments and I put my hand on my heart. Mr Gavin Anderson was right. I could feel it there. The person who has achieved so much - I could feel it in my heart. I sincerely believe that the simple yet sweet opening ceremony had set the mood for the rest of the events throughout the symposium. I scanned the people's faces as I walked through the busy corridors of Hilton Hotel, going from one session to another. It was an official and professional event, a serious event. And clearly, everyone was taking it very seriously and professionally. I had attended a lot of professional development events throughout my 8-years of teaching, yet this time it was different. The people were serious and professional, yet at the same time they were also celebrating. They were celebrating successes and achievements - theirs and also others. They were celebrating each other. They were celebrating teachers. At the end of the first day, I logged onto my Facebook. "We had a great day today. Let's continue the celebration tomorrow!" wrote one of my Facebook friend who was also one of the symposium presenters. Another friend had this as her status update: "Having a wonderful day today celebrating the hardwork of teachers." A friend sent me a message: "All the best for your presentation tomorrow. Have a good celebration. We'll celebrate it with you." Celebration. I love the word. "I knew that it was going to be a great learning experience and great for my professional development, but I never expected it to be this fun." The above was another Facebook post by another one of the symposium presenters. I guess the statement represents the feelings of most participants of the symposium. It was fun indeed, and throughout the three days I actually tried to ponder: what makes this event so different? What is so special about this symposium? 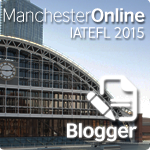 I have attended workshops and conferences before - local and international - yet it didn't feel the same. I chatted with a lot of people during the symposium - at the dinner table, in between sessions, at the lobby in the evening. Most participants of the symposium had this in common: they didn't just learn new things at the symposium, they were also very emotionally involved in the symposium. In my mind I tried to make the connection. I noticed the fusion of knowledge and emotions. People who came here didn't just enrich themselves in knowledge, they were also enriched emotionally. But I didn't know why. I couldn't find what it was in this symposium that had linked knowledge to emotions. What could the 'hook' be? Going from one session to another, I noticed another thing that the participants of this symposium had in common. Except for officials from the MoE, JPN, GBs and LOs, all teachers who came to this symposium were presenters. Almost everyone was nervous before his / her presentation. I couldn't eat breakfast the morning of my presentation. The sight and smell of the five-star hotel food made me nauseous. Someone told me that she saw a teacher hiding in the ladies, all nerves, struggling to breathe, comforted by her mentor. It wasn't easy for most of the presenters. Almost everyone struggled with the nervousness and the fear of speaking in front of people. Yet, there was no single session that I attended where I failed to be inspired by the teachers. They may be nervous, but they knew what they were talking about. Despite the nervousness, I noticed the glitter in their eyes as they confidently presented their successes. One teacher even broke down in tears in the middle of her presentation, as she related how she successfully overcome the hurdles and obstacles in her classroom. To me, it showed the extent of the passion and emotion that she had put into her research and presentation. These teachers are great, passionate teachers. It was a great blessing to be able to participate in their presentations and listened to their stories. I was sitting at the lobby and chatting with my Language Officer in the evening when she said: "Every teacher has successes. Yet at most times nobody knows about it; nobody wants to know, nobody cares. A symposium like this is a great opportunity for teachers to get their stories out, to share their successes with others." 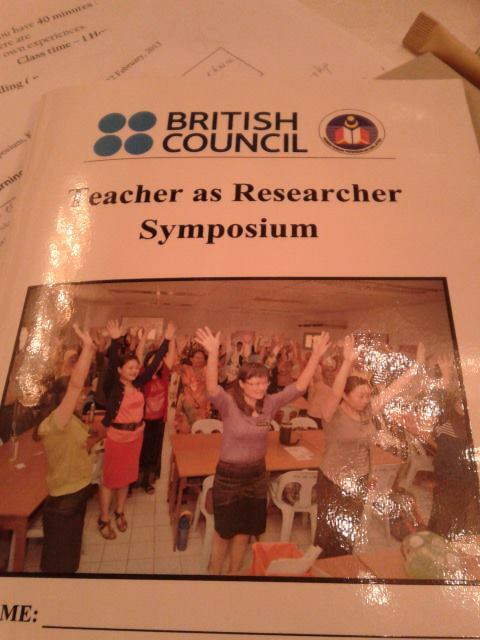 In this 'Teacher as Researcher' symposium, the teachers presented their researches. But they were also doing more than that. They were sharing their success stories - that perhaps before this, nobody knows and nobody wants to know. Now a lot of people know about the stories, and I'm sure it's a great feeling for them. It is indeed a great feeling. Believe me, I know. I had the chance to chat with another delightful person I met on the final day of the symposium. I told him about my 'knowledge-emotion fusion' theory. He seemed to agree with me. "What could the 'hook' be?" he asked me. "I haven't found it yet," I replied. Then we talked about how teachers are guided by the ELTDP mentors through the reflective practice in discovering their success stories. "Teachers are guided by the mentors, but they are not led by the mentors," I told him. I associated this with my journey in completing my own research with Justyna, my mentor. She was always there beside me when I was doing all the work, but she was never in front of me. She helped me, she supported me; but she didn't lead me. She didn't tell me what to do. She worked together with me, by my side; she helped me discover what I wanted to do, and she let me do it my way. "At the end of the day, what I can say is this. I'm very grateful to my mentor and I thank her so much for helping me get this far. I put her name on my title slide, but she told me time and time again that it isn't her story. It's my story. And now I believe her. I believe it with all my heart. It is indeed my story." "Do you think the other presenters feel the same way?" he asked. "Absolutely! You could see it in their eyes when they were presenting. Perhaps that was the reason why most participants are so emotionally involved, they can relate with the presenter because they had been through more or less the same experience. The mentors were there during the presentations, but it was all about the teachers. Some of them had to present without their mentors, yet they still seemed pretty proud and confident. You can see the pride, the satisfaction, the sense of ownership..."
I stopped for a moment. "That's it!" I exclaimed. "I found the 'hook'." Tricia Thorlby, the Director of ELTDP has had a dream about the symposium. It is exciting to be part of a dream come true. Well, I have a dream, too. I dream of a day when teachers will always be celebrated the way they are being celebrated in this symposium. I dream of a day when teacher professional development events mean more than just sitting down listening to people telling you how to do things right, and how wrong you've been doing things all these while. I dream of a day when teachers will always be able to share their success stories with people, knowing that however small the success may be, there are always more than enough reasons to celebrate. Someone (I think it was Puan Ho) quoted Lao-tzu in a speech: "A journey of a thousand miles begins with the first step." I believe the quote had made such a great impact on most participants, as I heard it being thrown repeatedly by presenters and audience alike in the sessions that I attended. 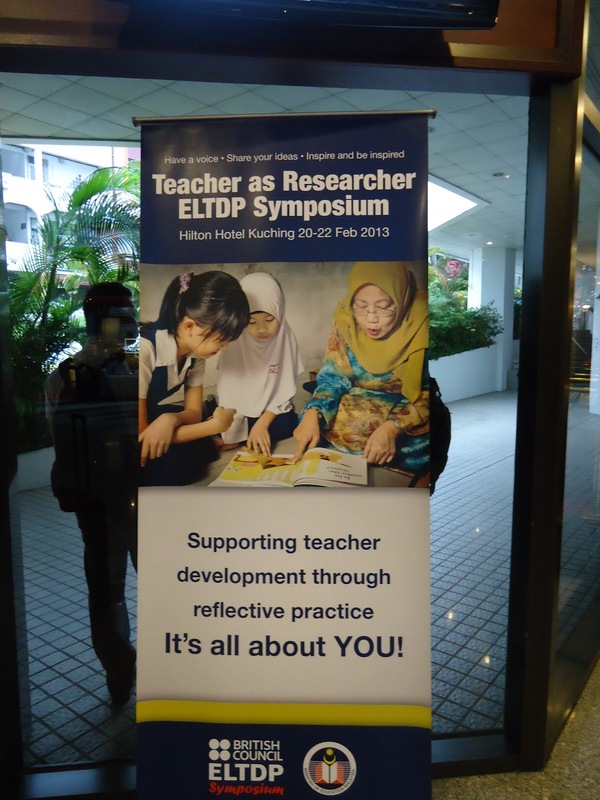 Teachers who attended this symposium are teachers with dreams. This amazing symposium, I believe, is the first step towards making the dreams come true.